What Are the Advantages of a Bespoke Warehouse Door? Much like the rhetorical question, “how long is a piece of string?”, warehouse door sizes depend largely on the application. The size varies from small doors for pedestrian access to large doors for wide loads. In fact knowing the average size of a warehouse door is almost entirely irrelevant, every door should be chosen to match its unique situation. While it is important to keep up to date with developments and successful applications in other work environments this should only inform you of your options. When you choose a door you should be matching it to the criteria of your warehouse and your vendor should assist you with that if necessary. While it is possible to get a standard door that fits your warehouse or to fit the portal to the new door, this is not always the case and not always best practice. Your door should be chosen to meet functionality criteria not the size of the portal you have. One of these criteria will be the largest load that will pass through the door, this size plus a buffer zone is a better guide than just choosing a door that is cheap or fits the space left by your old door. A tight seal is also essential for whichever door you choose because it lowers energy costs and keeps contamination threats and pests to a minimum. If you find yourself in a situation where an architect has already designed the doorframe and portal but you need to choose a door or you need to fill the space left by an unfinished project or broken door, your best option is a bespoke custom sized door. Meeting with a design and engineering professional can guarantee you that the door you choose will be the perfect match for your needs. A made to measure warehouse door is designed to meet your warehouse’s unique needs and in doing this can provide the absolute best standards for the job at hand. Custom made doors can take as little as 2-4 weeks if ordered and made locally or nationally. There are also benefits of having local technicians and specialists in reasonable proximity to check up on the door and provide any servicing if need be. Furthermore, one of the great features of a custom warehouse door is that by choosing a door specifically designed for its most essential functions it will be less likely to break down and need regular maintenance. Whereas, if you chose a large sectional door for a high-speed traffic area the door can quickly wear and stretch, ending in premature failure or even a severe accident. If you are refitting multiple portals or even the whole warehouse it is also possible to create a single custom door design and apply it to each doorway. This allows you to stock spare panels and common sized parts for your multiple doors. So even though they are custom fitted you can take advantage of standardised costing. There are several advantages to choosing a standard door. The first is a lowering of initial costs through economies of scale. By not requiring a design consultation and one-off production you can buy a mass-produced solution and benefit from its associated cost reduction. However, if your focus is cost, you have to be careful that you plan for long-term costs as well as the short-term. Intially it may be cheaper to buy a standard sized door, but in the long run, a door that is designed to perform the exact function you require will have a longer life and reduced associated maintenance and replacement costs. Another advantage of standard doors is that you are buying a proven product. You have assurances that the product you choose has worked in multiple previous situations and you do not have to worry about any unseen errors or faults. However, this disregards the fact that while a standard door may have worked in another warehouse it might not be suited to the unique conditions of your warehouse. The final advantage of a standard door is the availability of technicians and parts for maintenance. With a popular standard door you have the opportunity to access any number of technicians that have worked with the same door before. This can reduce hefty call-out fees and long wait times for a technician to arrive. It also means that it is possible to get spare parts quite easily. There are some custom warehouse door vendors however who operate locally and service a vast array of doors, including those they don’t normally install. You should check to see if your custom warehouse door vendor has technicians located locally and what their average response time is. 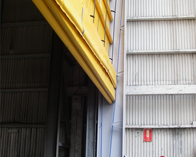 It is also worth considering the reliability and lower need for maintenance of a custom warehouse door over a standard warehouse door that may not be designed to perform its function. Overall, custom doors are the better option because they provide the opportunity to create a product that fits your requirements exactly. This lowers maintenance costs, increases the life of the door and also saves you money through energy savings and less down time. The factors you need to consider when deciding on custom or standard doors are numerous. Out of everything the most important factor is having a long-term view of the door. See it as an investment not just a quick fix and it will bring you less trouble and save you more money. If you think you need a new door or you want to assess your current situation please download our warehouse door condition report by clicking on the link below.